Aadams Washington landscaping is your best friend when it comes to keeping your backyard an oasis. We are the backyard experts keeping your life in order, your trees away from power lines, and your aquatic plant-life brimming and swimming. But, the question may linger in someone’s mind, “are they any good?” Being the anti-horn-tooting bunch we are, we’ll let the team at Roadside Multimedia speak in our behalf regarding a tree-trimming service we recently did for their local business. What does Roadside Multimedia do? We are a Website Development and Marketing team that partners with the most prestigious organizations such as Clinical Mastery Series and Gold Dust Dental Lab. 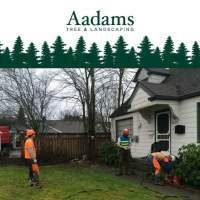 Why did you contact Aadams Washington Landscaping? We had some “problem trees” that were a high risk to our business. We needed a Landscaping professional in the Marysville, Washington area that we could trust wouldn’t knock down our power lines or smash a hole in our company’s roof; you know, the usual business owner’s concern. There were some Large Locust tree branches that were hanging over the fence and intertwined with other trees. These trees were surrounded by fencing, a garage and another Large Locust. Another clump of trees overhanging the office were also intertwined with power lines. Delightfully so, much care and precision was exercised by the half-ape half-human crew of Aadams Tree. All the trees were removed in small sections and with absolutely zero damage! Would you recommend Aadams to other business owners? Yes, yes, yes. Yes, again. See, with the constant rains and storms in our area, we didnt want to wait until an accident happened to call Aadams; we decided to be safe rather than sorry and in exchange now have a beautiful landscape (despite the Washington weather). 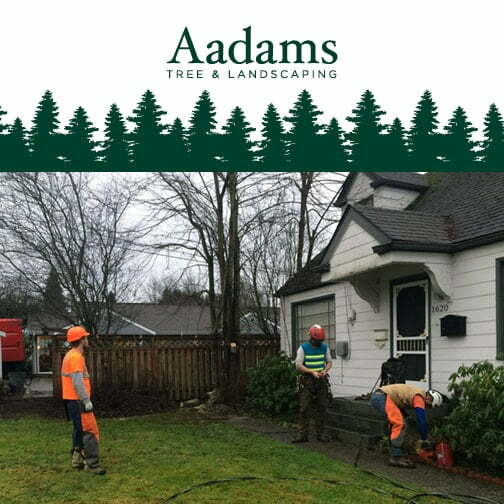 Aadams is the way to go if you are a business or homeowner. They are amazing experts at trimming trees, removing stumps, and transforming your landscape into an enviable oasis. It’s impressive to watch and even more impressive once their skilled crew is done. You won’t regret it. Over to you, would you prefer to climb a tree yourself, or have an expert do it for you?